Against the backdrop of the unfurling trade war, we don't expect the Monetary Authority of Singapore (MAS) to tighten policy any further at its October meeting, but with growth and inflation data holding firm in recent months, the balance of risks has shifted back slightly towards more tightening. Recent activity data hasn't been bad, now the inflation figures are following suit. Looking back over the last month, and Singapore's run of data has been a bit better than we had expected. At the end of July, Industrial production surprised on the upside, retail sales weren't bad, 2Q GDP was a slight miss, but is more about the past than the present, so we will ignore that (conveniently), and non-oil domestic exports (NODX) were also decent. 3Q18 has started well, and from a reasonable 2Q18 base. Today's inflation figures slot into that picture, with a satisfactory reading that saw headline consumer prices fall 0.1% on the previous month to leave inflation at 0.6%YoY, but the core rate focussed on by the MAS, pushing up from 1.7% to 1.9%YoY, above our and consensus expectations. 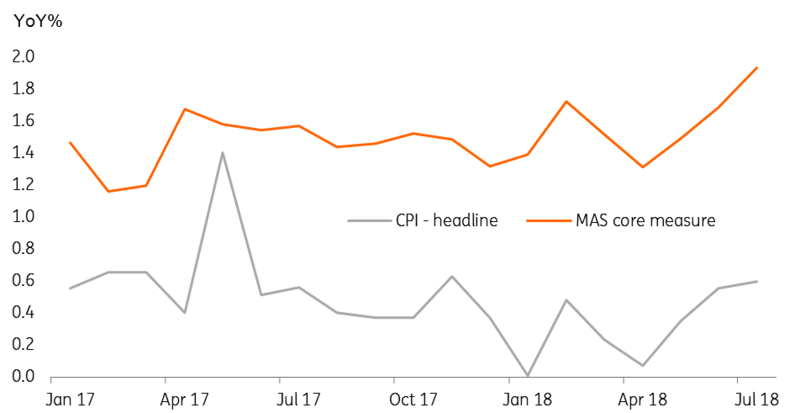 There is no MAS inflation target as such (just some expectations), but at close to but just a little below 2.0%, we imagine the MAS will be happy with that outcome. Does this justify more MAS tightening? If nothing else were changing, we might be sympathetic to some more tightening by the MAS at the October meeting. But the global economic outlook is far from clear, and with the only other Asia economies tightening being those under FX depreciation pressure (Singapore dollar has been one of the regions outperformers since April), the rationale for stepping up tightening again seems poor. This could change. If for example, the trade war ended, and Emerging Market pressure lifted amidst a weakening US Dollar, tightening could resume. But if anything, we expect the global growth and trade backdrop to get worse, not better, and that suggests the MAS will keep conducting monetary policy much more cautiously.